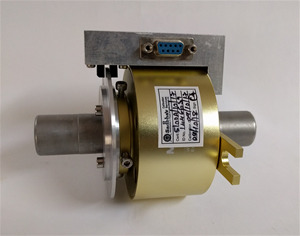 Description : ADI ARTECH’S Torque transducer TTD is general purpose dynamic rotary type torque sensor for accurate measurement of Torque and RPM in rotating shaft or equipment. It is constructed from hardenable, SS 17-4 PH material. This is strain gage based sensor with full temperature compensation over 050C. It is very accurate, reliable and sturdy for industrial applications. It is compensated for axial and bending forces for accurate torque measurements. It is available from 0 to10NM to 0 to 50KNM ranges Torque sensing shaft is installed in ball journals and electrical signals are transferred through high quality, low noise slip ring and brush mechanism. TTD is available in wide variety of options: both ends shaft, both ends flange and combination of shaft & flange versions for dynamic torque measurements. It is available for speed up to 2500 RPM max. Customized version can be provided as per user’s dimensions and capacity. This is provided with male shaft with key slot for locking at both ends. Features : 0-50NM to 0-50KNM Capacities available. Hardenable Stainless Steel 17-4 PH construction for resistance against shock and overload. Can be designed to fit your dimensional needs. Other capacities are available on request. Electronic Instrumentation / Software : 6 digit Digital display with – 0.5% accuracy Tare, Net and Gross data display, Peak Hold facility, 0-10 Volt DC or 4-20 m A output for PLC interface, 10 point linearization, Serial interface port of RS232 or RS485 or USB with MODBUS RTU protocol or Ethernet Connection, Software for Graphics, Tabulation and Analysis, Over load detector with relay output for alarm and trip action for safety, Multipoint point logger with Wi-Fi connectivity, Multipoint relay output with Auto/manual Tare, Auto/Manual Start, Stop controller Large Digit Remote Display. Wireless Radio Transmitter for remote Display or Computer Interface. D’cell digital module internally fitted to the sensor or externally connected.